As my excitement grows for Bungie's upcoming project 'Destiny,' so too grows my need to make fanart of it. So here ya go! Both Bungie and my own expectations are setting a pretty high bar for the game, but I've followed Bungie's work for long enough now that I trust them to deliver, and every time they release some new tidbit of information about the game it only reinforces my high hopes. So I am quite excited, more so than I usually let myself get for a video game these days. It's fun having something to look forward to! One of the terms/keywords/hashtags that has been making the rounds since the gameplay reveal at E3 is 'space magic.' In Destiny, the player will act as a Guardian, a member of a knight-like order in the far future with the mission of protecting the last remaining city of humanity. These Guardians are imbued with special powers that vary slightly according to their chosen class, and the Bungie community has taken up the moniker of 'space magic' to refer to these awesome and arcane powers, which can be used alongside the high-tech assault rifles and spaceships that will populate the Destiny universe. 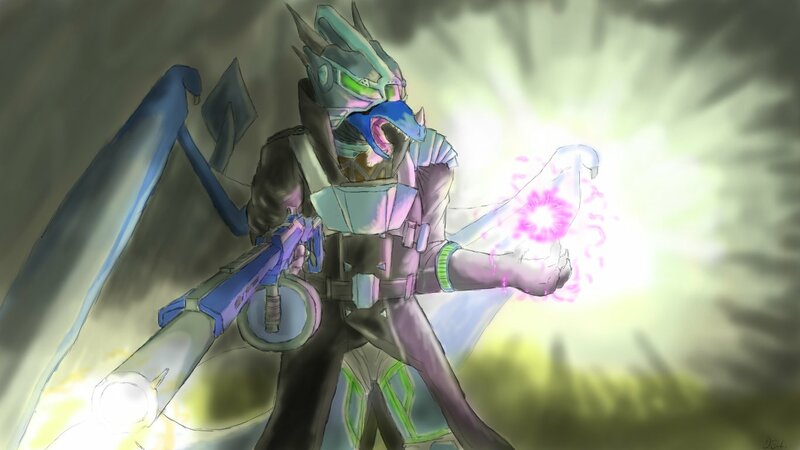 So pictured here is myself as a Warlock, charging up a nova bomb with the intention of doing some serious damage to whichever baddies seem to be threatening me at the moment, while firing off a combat rifle with the other hand. The rifle is once again based on my trusty Stomper mk. III. The picture didn't turn out quite as awesome as the mental image that inspired it, but it was still fun to do!